Recently, I seem to be a sucker for a new type of cleanser. Gone are the days of wetting my face before sudsing up (though, to be fair, I still do love my Dermalogica cleansers). Recently, it seems like all I do is use cleansers that are meant to be applied to the skin dry -- like Eve Lom Morning Time Cleanser. Now, I'll be honest -- I don't use this cleanser in the morning. No, I use it at night before bed. In the morning, I do still like to use my cleanser in the shower, which means it's my standby Dermalogica Special Cleansing Gel that takes the cake. But at night? I'm all about Eve Lom. Inspired by the original Eve Lom Cleanser, this is a lighter version with a unique grainy texture -- different from other cleansers I've tried. There are conflicting opinions on the scent, but I happen to LOVE it -- the combination of aromatic hops, eucalyptus, Egyptian chamomile and clove oil give off a nutmeg-like aroma that makes me feel so homey and ready for crisp temperatures. Papaya fruit enzyme exfoliates the skin while decongesting and minimizing the appearance of pores, while carrot oil (packed with pro-Vitamin A), stimulates collagen production. In short? This cleanser has shot to the top of my must-have list. It smells incredible and a dime-sized amount is all that's needed to leave my skin feeling tingly and super-clean. 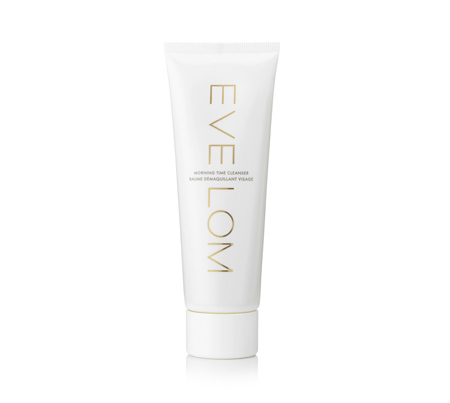 Eve Lom Morning Time Cleanser retails for $60 at beauty.com.